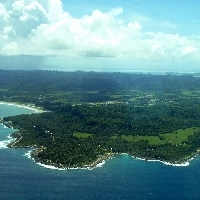 Simeulue island, in Aceh province. 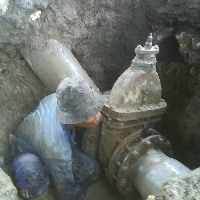 NWC valve excavation and repair. CHALLENGE. Simeulue, a small island district in Indonesia's Aceh province, lacked a residential water supply system. Its aging treatment facilities sat derelict and had never been functional. Residents were forced to obtain water directly from a local river. SOLUTION. Contracting with multiple international NGOs, NWC set out to restore and extend the drinking water supply infrastructure for Simeulue. A catchment system on high ground provided the opportunity for an efficient, low-maintenance gravity-feed system. However, the intake site was surrounded by largely impassable terrain, necessitating innovative engineering solutions. 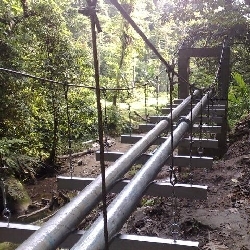 NWC custom-built special structures, including a suspension bridge, to accommodate the piping systems. Due to the challenges presented by the island's terrain and small size, all engineering structures, such as the suspension bridge and catchment basins, were constructed on site without heavy construction equipment, using materials shipped in from the mainland. Additionally, our engineers rehabilitated the water treatment facilities in Sinabang, Simeulue's principal city. RESULT. 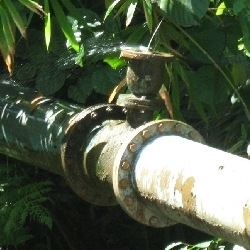 As a result, Sinabang and the surrounding region now have Simeulue's first-ever intact conduit for clean drinking water. Ongoing work will establish residential plumbing connections and continue to expand clean water access on the island.